Depending on how big a shake is and the ingredients it contains, a protein shake might have fewer than 100 calories or more than 1,000. Your dietary and fitness goals can help dictate the calorie range that's right for you in a shake, but it's also important to consider the quality of the shake's ingredients and what the alternatives might be. Using an online calorie counter can help you make smarter decisions about what you put in your shakes. The calories in your protein shake depend on the ingredients. Unless you're trying to add calories and protein to bulk up, a healthy protein shake should contain about 200 calories. A typical scoop of protein powder is between 30 and 50 grams, or 1/4 cup, but its calorie count can vary. A scoop of whey powder has about 100 calories, while a scoop of soy powder has about 175. A scoop of brown rice powder has 110 calories, and approximately equivalent amounts of pea powder and hemp powder have 130 calories and 135 calories, respectively. If you're making your own shakes, you may use alternate protein sources like milk, yogurt or soy milk. One cup of low-fat milk has about 120 calories, 1 cup of nonfat Greek yogurt has 130 calories and 1 cup of unsweetened soy milk has about 100 calories. Commercially prepared protein powders and packaged shakes almost always contain additives that act as flavorings, stabilizers and preservatives. These ingredients do add calories, but typically the bulk of the calorie count is from the concentrated protein. Additives may include natural or artificial flavors, cellulose gum or xanthan gum, and sweeteners such as corn syrup, sugar, fructose or sucralose. When making a shake at home, you'll find that your additives are more likely to be whole-food ingredients like fruits, peanut butter, honey or cocoa powder. 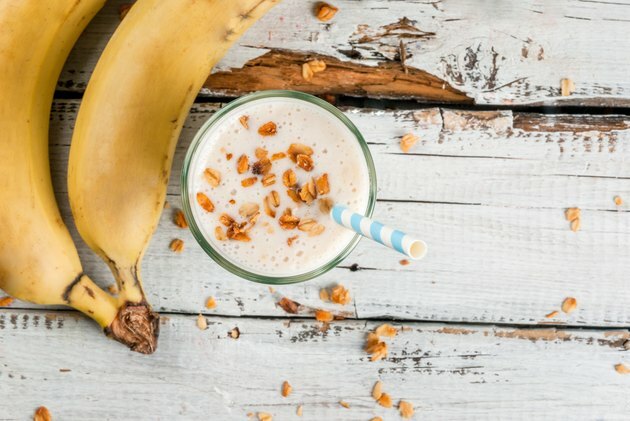 A medium banana adds about 105 calories to a shake. A tablespoon of peanut butter has about 94 calories, a tablespoon of honey has 64 and tablespoon of unsweetened cocoa powder has 12. How many calories your shake should contain depends on your goals. If you exercise a lot and are actively trying to gain muscle weight, you probably want a shake with at least 20 grams of protein and several hundred calories. If you're trying to lose weight, in contrast, you may want to limit calories and use your shake as a meal replacement. If that's your strategy, Jefferson University Hospital registered dietitian Emily Rubin recommends keeping your shake under 200 calories. Whether you're trying to lose weight, maintain or gain, the calorie count of what you're eating won't necessarily tell the whole story. As dietary supplements, protein shakes are a combination of concentrated and isolated nutrients, and they rarely contain whole foods. Unfortunately, that means they also come without protective substances like phytonutrients and antioxidants, which can help prevent disease and boost immunity. Before you make protein shakes a fixture in your regular diet, talk with your doctor.